Prime Minister Ahmet Davutoğlu said on Thursday evening that there are disappointments and the EU has un-kept promises in recent Turkish-EU relations and that Turkey will stop implementing the recent readmission agreement if the EU does not keep its word and grant visa-free travel to Turkish citizens. 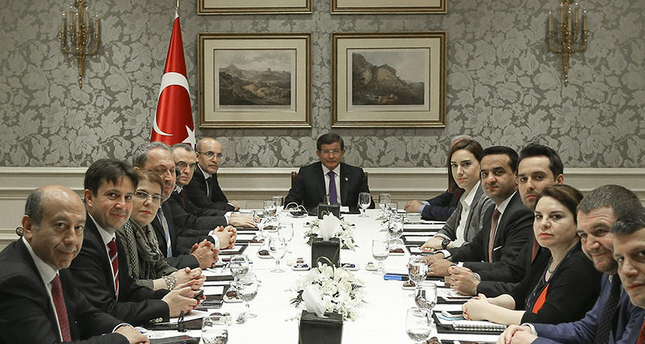 Speaking to a group of journalist who accompanied his visit to Qatar on Thursday, Davutoğlu said that Turkey is successfully implementing the EU-Turkey deal from March 18 and that the deal has ended illegal migration to Europe. "Last October there were 6,800 illegal migrants passing over to Europe from Turkey every day. This figure went down to 3,000 in January after we started to implement the terms of the November deal with EU. We made a game changing move with the March 18 deal and this figure is now about 25 per day. Moreover, in April there have been some days on which no migrant passed to Europe," Davutıoğlu said, and asked: "Have you heard about the death of a migrant in the Aegean Sea since April 4?" Asserting that Turkey will fulfill all EU criteria for visa-free travel on Monday, Davutoğlu said that Ankara will stop implementing the readmission agreement if the EU does not grant visa-free travel. "These two issues are linked to each other and are part of the deal with the EU. This is a test for everyone. We think that we have passed our test," Davutoğlu said, and added that it is now time for the EU to fulfill its obligations. "[The EU] promised to invest 1 billion euros for refuges until end of July. We will see whether they keep their promise or not. We have experienced disappointment in the past. We will react negatively if these experiences reoccur," Davutoğlu said, adding that in 2004 the EU had promised to lift restrictions on Turkish Cypriots if they vote for the Annan Plan, but it did not keep its promise afterward. Commenting on his first visit to Qatar as Prime Minister, Davutoğlu underlined that he is very pleased with the level of bilateral relations. ''There is a serious positive momentum in our bilateral relations. Qatar's national vision for 2030 and 2022 FIFA World cup which is scheduled to take place in Qatar provides various opportunities for Turkish firms.'' he said while adding that Qatari officials expressed in the bilateral meetings that they would welcome Turkish firms not only in construction sectors in other areas as well. Responding to the question on how he evaluates Foreign Minister Mevlüt Çavuşoğlu's recent visit to United Arab Emirates, PM Davutoğlu said that the visit was successful. ''We had experienced serious tensions in bilateral relations after the military coup in Egypt. But Foreign Minister Mevlüt Çavuşoğlu paid a successful and fruitful visit. This positive development will provide more maneuvering space for Turkish foreign policy.'' he said. Touching on the Turkish-Israeli normalization process, Davutoğlu said that negotiations have already reached an advanced stage and that the talks may yield positive results soon. "We have requested from Israel to provide basic needs such as water and electricity to our Gazan brothers. The deal can be sealed if there is progress on this issue. The negotiations have reached an advanced stage. There are still some minor details that will benefit Palestinians. Hopefully it will be done," he said.